Providing the Denver area with professional, fast and eco-friendly junk removal services. What Are Customers Saying About Junk King Denver? 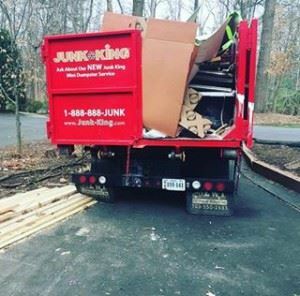 When Junk King says, “We do all the work” they mean that quite literally. You don’t even have to “prep” your junk by bringing it downstairs or out to the driveway. Just leave it right where it is in the crew will take care the rest. Junk King knows how valuable your time is and they certainly don’t want to waste it. That’s why they’ll keep you informed at every step of the process. They’ll be in and out before you even notice it! Hassle free junk removal is only a phone call away. Make that call to Junk King Denver today. This entry was posted in Denver Junk Removal and tagged clutter, Junk King, junk removal on September 30, 2017 by Junk King. Last updated October 1, 2017 . Offer you an estimate in writing. Give you the best overall value in our industry.